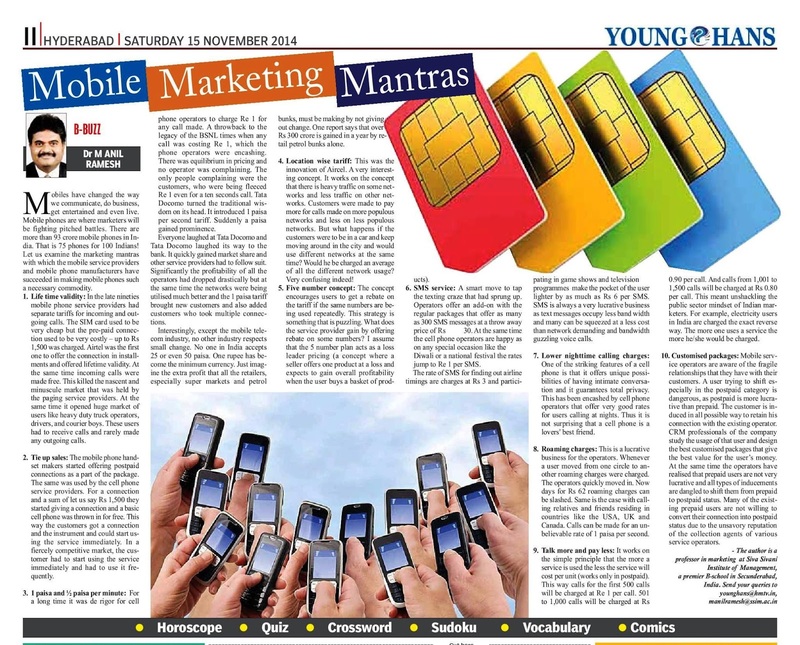 Dr.Anil - Marketing Musings: 23rd article published in HANS INDIA (15 November 2014) It is titled " Mobile Marketing Mantras"
23rd article published in HANS INDIA (15 November 2014) It is titled " Mobile Marketing Mantras"
23rd article published in HANS INDIA (15 November 2014) It is titled " Mobile Marketing Mantras!" Mobiles have changed the way we communicate, do business, get entertained and even live. Mobile phones are where marketers will be fighting pitched battles. There are more than 93 crore mobile phones in India. That is 75 phones for 100 Indians! Let us examine the marketing mantras with which the mobile service providers and mobile phone manufacturers have succeeded in making mobile phones such a necessary commodity. 1.Life time validity: In the late nineties mobile phone service providers had separate tariffs for incoming and outgoing calls. The SIM card used to be very cheap but the pre-paid connection used to be very costly – up to Rs 1,500 was charged. Airtel was the first one to offer the connection in installments and offered lifetime validity. At the same time incoming calls were made free. This killed the nascent and minuscule market that was held by the paging service providers. At the same time it opened huge market of users like heavy duty truck operators, drivers, and courier boys. These users had to receive calls and rarely made any outgoing calls. 2.Tie up sales: The mobile phone handset makers started offering postpaid connections as a part of the package. The same was used by the cell phone service providers. For a connection and a sum of let us say Rs 1,500 they started giving a connection and a basic cell phone was thrown in for free. This way the customers got a connection and the instrument and could start using the service immediately. In a fiercely competitive market, the customer had to start using the service immediately and had to use it frequently. 3.1 paisa and ½ paisa per minute: For a long time it was de rigor for cell phone operators to charge Re 1 for any call made. A throwback to the legacy of the BSNL times when any call was costing Re 1, which the phone operators were encashing. There was equilibrium in pricing and no operator was complaining. The only people complaining were the customers, who were being fleeced Re 1 even for a ten seconds call. Tata Docomo turned the traditional wisdom on its head. It introduced 1 paisa per second tariff. Suddenly a paisa gained prominence. Everyone laughed at Tata Docomo and Tata Docomo laughed its way to the bank. It quickly gained market share and other service providers had to follow suit. Significantly the profitability of all the operators had dropped drastically but at the same time the networks were being utilised much better and the 1 paisa tariff brought new customers and also added customers who took multiple connections. Interestingly, except the mobile telecom industry, no other industry respects small change. No one in India accepts 25 or even 50 paisa. One rupee has become the minimum currency. Just imagine the extra profit that all the retailers, especially super markets and petrol bunks, must be making by not giving out change. One report says that over Rs 300 crore is gained in a year by retail petrol bunks alone. 4.Location wise tariff: This was the innovation of Aircel. A very interesting concept. It works on the concept that there is heavy traffic on some networks and less traffic on other networks. Customers were made to pay more for calls made on more populous networks and less on less populous networks. But what happens if the customers were to be in a car and keep moving around in the city and would use different networks at the same time? Would he be charged an average of all the different network usage? Very confusing indeed! 5.Five number concept: The concept encourages users to get a rebate on the tariff if the same numbers are being used repeatedly. This strategy is something that is puzzling. What does the service provider gain by offering rebate on some numbers? I assume that the 5 number plan acts as a loss leader pricing (a concept where a seller offers one product at a loss and expects to gain overall profitability when the user buys a basket of products). 6. SMS service: A smart move to tap the texting craze that had sprung up. Operators offer an add-on with the regular packages that offer as many as 300 SMS messages at a throw away price of Rs 30. At the same time the cell phone operators are happy as on any special occasion like the Diwali or a national festival the rates jump to Re 1 per SMS. The rate of SMS for finding out airline timings are charges at Rs 3 and participating in game shows and television programmes make the pocket of the user lighter by as much as Rs 6 per SMS. SMS is always a very lucrative business as text messages occupy less band width and many can be squeezed at a less cost than network demanding and bandwidth guzzling voice calls. 7. Lower nighttime calling charges: One of the striking features of a cell phone is that it offers unique possibilities of having intimate conversation and it guarantees total privacy. This has been encashed by cell phone operators that offer very good rates for users calling at nights. Thus it is not surprising that a cell phone is a lovers' best friend. 8.Roaming charges: This is a lucrative business for the operators. Whenever a user moved from one circle to another roaming charges were charged. The operators quickly moved in. Now days for Rs 62 roaming charges can be slashed. Same is the case with calling relatives and friends residing in countries like the USA, UK and Canada. Calls can be made for an unbelievable rate of 1 paisa per second. 9.Talk more and pay less: It works on the simple principle that the more a service is used the less the service will cost per unit (works only in postpaid). This way calls for the first 500 calls will be charged at Re 1 per call. 501 to 1,000 calls will be charged at Rs 0.90 per call. And calls from 1,001 to 1,500 calls will be charged at Rs 0.80 per call. This meant unshackling the public sector mindset of Indian marketers. For example, electricity users in India are charged the exact reverse way. The more one uses a service the more he/she would be charged. 10. Customised packages: Mobile service operators are aware of the fragile relationships that they have with their customers. A user trying to shift especially in the postpaid category is dangerous, as postpaid is more lucrative than prepaid. The customer is induced in all possible way to retain his connection with the existing operator. CRM professionals of the company study the usage of that user and design the best customised packages that give the best value for the user’s money.